The presentation generated lots of interest in the Digital Business Ecosystem, and I was asked to give a short briefing on the subject for students of the ESEEI university together with Nathan Wilson from DreamWorks. DBE was also being presented in the World Summit on the Information Society, and the Brazilian delegation including Minister of Culture Gilberto Gil got interested in bringing the concept to their country. The Free Software movement is very strong in the area, and it will be interesting to watch where they will be able to take DBE. Some local developers are already waiting for a stable OpenPsa 2 release to become available so that they can start experimenting the the DBE connectivity. One Brazilian blog has a photo of me discussing DBE with Nathan and Jon “Maddog” Hall after my speech. Updated 2005-11-30: I will be presenting DBE also in SOLISC tomorrow. 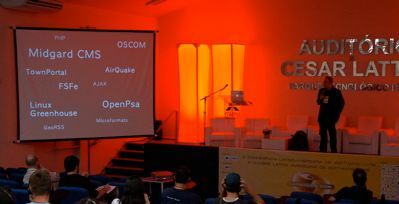 Also there are two photos of my talk on the LatinoWare site.